St Paul's became Jersey women's champions again after a comfortable 4-0 win over St John in the title-decider at Springfield. The two sides went into the game level on points, both knowing a win would see them clinch the title, but a draw would lead to an extra play-off game. Goals from Catarina Andrade and Jemma Daniel put St Paul's in control. 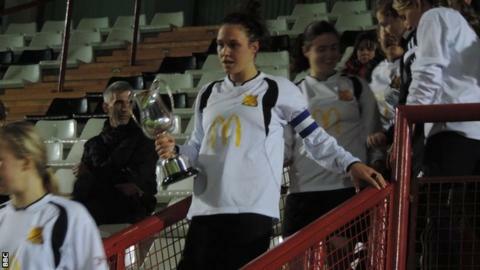 And skipper Eve Watson and Irina Jaworksi netted after the break to seal the victory and the trophy. There has never been an end-of-season play-off in Jersey's women's league, and St Paul's took the match by the scruff of the neck early on, with Watson's header from a corner just wide. Andrade got the opener soon after though when she toe-poked the ball past onrushing goalkeeper Sara Luce. Daniel doubled the advantage five minutes before half-time, slotting in after Luce missed the ball as she tried to kick clear. After the restart, St John pushed for a goal to bring them back into the contest, but midfielder Watson added her side's third from close range. With 20 minutes to go the result was put beyond doubt when a free-kick found its way through to Jaworski, who tucked the ball home. Watson lifted the trophy four years to the day since her father passed away, and afterwards dedicated the victory to him. "It is a special day in my heart and I came out today hoping I could score a goal and win," she told BBC Radio Jersey. "My team have done me proud, I was over the moon to score." The bottom two, Jersey Wanderers and St Peter, face each other on Sunday in the island's final league game of the season.